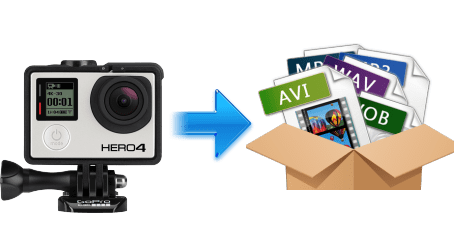 To convert GoPro video to MP4 MOV or other formats, edit GoPro video in iMovie, compress large GoPro 4K video to smaller size, upload GoPro video to YouTube or so, a GoPro video converter is deemed as indispensible. And this post will be helpful for all GoPro video conversion, editing, compressing and uploading. GoPro is no stranger to you if you are an extreme sports enthusiast. And you, of course, know the to-be-released GoPro Fusion is able to capture stunning 5.2k resolution VR and non-VR videos. But all GoPro models (the latest version is no exception) pose a codec problem - videos recorded by GoPro Hero 4/3/2 are saved in MPEG4 format with H.264 codec that is unfriendly for no-linear editing applications like iMovie, Premiere, Vegas, etc and leads to a choppy or jerky playback experience in VLC. What's worse, the large HD/4K videos are huge in size, making it impossible to upload to YouTube, let along the 5.2k recordings. Therefore, an easy-to-use GoPro video converter is a must have. * Convert GoPro MP4 H.264 video for editing in iMovie, FCP, AVID, Vegas, etc. * Compress large GoPro 5.2k/4k/HD video to smaller-sized WMV, FLV and MOV. * Trim/crop/merge/edit GoPro videos, add SRT subtitles to GoPro video. * Convert GoPro video to MP4/FLV/WebM web formats for uploading to YouTube. * Transfer GoPro video to iPhone, iPad, PS4, Windows Phones, with 420+ profiles. 1. Why iMovie won't recognize GoPro HD MP4 files? GoPro captures high quality video at 1080p 30, 720p 60, 4k 60 and even 5.2k 30 resolutions and frame rates. It outputs videos in MP4 format and compresses files using H.264 codec to ensure good quality. But the GoPro video encoded in h.264 may lack some information or tags that the iMovie may require. That's why you are informed of "empty" tracks or "could not import unknown" error when you import MP4 files to iMovie for editing GoPro videos. 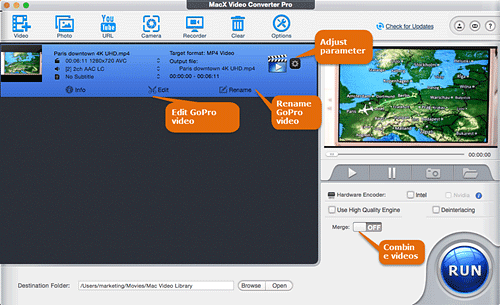 So you have to convert GoPro video to iMovie format first relying on a GoPro video converter tool. You have to notice that different media players or even the computers have specific rules. For example, Windows Media Player doesn't support playing GoPro videos higher than 720p 120 fps. Computer with lower system configuration only plays videos lower than 1080p 60fps as it cannot process the data of large HD video files fast enough. Even when you use VLC to play GoPro MP4 video, it appears to jump from frame to frame since H.264 compresses and decompresses the videos heavily and there is no more space on the card, making it hard for the computer to play them. Any you have to rely on GoPro video converter to make the GoPro video files recognized by your media player, computer or other portable devices. 3. What is the best GoPro video converter so far? The best GoPro video converter shall extends the use of GoPro videos and convert the GoPro video into the file format you desire, whether you want to play them on Mac, Windows, media player, mobile devices, share them on web sites, or personalize them in iMovie, AVID, etc. The ability to convert 4k, h.264, 5k, 8k, is preferable. Plus, easy to use, high image quality and fast video processing speed are the top criteria when choosing the GoPro video converting tool. The high-end VideoProc is the one, which can convert GoPro videos to MP4, AVI, MOV, WMV, MPEG, MKV and all the other video formats and transcode GoPro videos or other camcorder recordings to iMovie, Final Cut Pro, YouTube, Facebook, iPhone, iPad, Samsung, Android, etc with 400+ readymade profiles. It is also known as the great 4k video converter that can process 8k and 4k UHD videos as fast as possible. The conversion speed reaches up to advanced 47x real time faster by making upmost use of multiple CPU cores, Intel QSV/Nvidia/AMD GPU hardware acceleration and built-in hyper-threading technology. To upload GoPro video to YouTube, we recommend to convert GoPro video to MP4/FLV. Click to see best YouTube video format and setting. To compress GoPro 4k/HD videos as small as possible, please convert GoPro 4K/HD videos to WMV/FLV and compress 4k to 1080p for smaller size. To edit GoPro video in iMovie, we recommend to convert GoPro video to MP4 or MOV format in iMovie profile as the output format ensures high image quality but smaller file size, yet have good compatibility with other devices. Click to see the best iMovie video format. Step 1: Free download and install the great GoPro video converter on your computer (or download for Mac version). This tool is free from any adware, malware, virus or ransomeshare. It's 100% safe. Step 2: Load GoPro video by clicking +video button or directly drag and drop the GoPro 4k/HD video into the simple interface. It also supports batch converting multiple GoPro videos at a time. Step 3: Choose the video format as per you need when the output profile window pops up. For instance, you can navigate to Apple Device -> to iMovie Video or to Final Cut Pro Video if you need to edit GoPro video. Or, go to Web Video Profile -> YouTube Video in case you want to upload it. a) Click the gearwheel button to reset the video codec, resolution, frame rate, aspect ratio (16:9), etc. b) Click "Edit" to crop GoPro video, edit out the black bars, enable or add SRT subtitles, and more. c) Click "Merge" to combine multiple GoPro video footages into a single video. d) Click "Rename" to change the video name, artist, genre, etc. Step 4: Tap "RUN" to start the GoPro video conversion. This tool makes full use of Intel QSV, NVIDIA CUDA and AMD APP to speed up the conversion to the world's fastest. GoPro[wiki]: GoPro is famous for manufacturing eponymous action cameras to capture sports and other venturous activities in high video quality, up to 4k resolution. It is widely used by athletes, videographers, adventurers and sports enthusiasts. Decode GoPro (H265/H264) video to MP4, MOV, AVI, MKV, FLV, etc. 180+ formats with intact quality!